Dr. Margie Snyder selected as the Faculty Mentor of the Year with the Department. Read more about Dr. Margie Snyder selected as the Faculty Mentor of the Year with the Department. Please join me to congratulate Dr. Jasmine Gonzalvo. Jasmine was recently recognized as a Fellow for the American Association of Diabetes Educators (FAADE). Fellows of AADE are recognized diabetes educator leaders who have made outstanding contributions to AADE and diabetes education and care through clinical practice, research, education, or health policy, including the development and implementation of mentorship programs for diabetes educators. Great work Jasmine! Dr. John Hertig was recently appointed to represent the United States on the FIP Working Group on Patient Safety in collaboration with the World Health Organization. Please join me to congratulate Dr. John Hertig. John was recently appointed to represent the United States on the FIP Working Group on Patient Safety in collaboration with the World Health Organization. Congratulation John! Read more about Dr. John Hertig was recently appointed to represent the United States on the FIP Working Group on Patient Safety in collaboration with the World Health Organization. During the Provost’s Faculty Awards Convocation on Wednesday, many of our Department’s faculty were recognized for their outstanding contributions during this past year. Below, I have listed all those faculty along with their respective recognition. Please join me to congratulate these faculty and wonderful contributions! 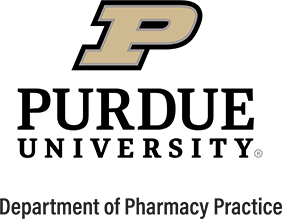 Dr. Patti Darbishire was recently selected to participate in the Purdue Insights Forum. Read more about Dr. Patti Darbishire was recently selected to participate in the Purdue Insights Forum. Dr. Ellen Schellhase was recently appointed as a Scholarship of Engagement Fellow. Please join me to congratulate Dr. Ellen Schellhase. Ellen was recently appointed as a Scholarship of Engagement Fellow. This program, through the Office of the Associate Provost for Engagement, fosters the development of the scholarship of engagement for faculty throughout the Purdue system in support of the promotion and/or tenure process. Congratulations Ellen! Read more about Dr. Ellen Schellhase was recently appointed as a Scholarship of Engagement Fellow. Dr. Kristin Villa was selected to participate in the Summer Course Design Institute through the Center for Instructional Excellence. Please join me to congratulate Dr. Kristin Villa (major advisor Matt Murawski). Kristin was selected to participate in the Summer Course Design Institute through the Center for Instructional Excellence. Kristin will be creating an online version of the pharmacy law course. Read more about Dr. Kristin Villa was selected to participate in the Summer Course Design Institute through the Center for Instructional Excellence. Dr. Omolola Adeoye was awarded an AcademyHealth Diversity Scholarship. Please join me to congratulate Dr. Omolola (Lola) Adeoye and her fellowship director Margie Snyder. Lola was awarded an AcademyHealth Diversity Scholarship. This scholarship supports her travel and registration for the AcademyHealth Annual research meeting in Seattle, WA. She also is paired with a mentor who is an expert in health services research. We believe she is the first pharmacist to recieve one of these awards. Congratulations Lola! Read more about Dr. Omolola Adeoye was awarded an AcademyHealth Diversity Scholarship. I want to thank the many faculty and staff from our Department who attended the PharmD graduation banquet last Friday. It was an excellent event to honor our graduating students! I also want to specifically congratulate some of our faculty who were recognized at the banquet. Please join me to congratulate Dr. Kristin Reiser. Kristin recently pass the Board Certification for Ambulatory Care Pharmacists (BCACP). Congratulations Kristin!